I only heard Bill Fay for the first time at the start of this year - his track ‘Screams In My Ears’, a manic, piano-driven swingtime affair, appears on the excellent Decca prog/blues/rock anthology ‘Legend Of A Mind’. Interest duly piqued, I was pleasantly surprised (nay astonished) to find a CD reissue of Fay’s subsequent two albums in my local music library. The self-titled debut from 1970 has a relatively chipper looking Fay on the cover, apparently having just walked across the waters of the Serpentine. The music inside is accomplished singer-songwriter fare, though occasionally obscured by some over-wrought orchestral arrangements. Heard in isolation, you might conclude that this was an interesting period piece, with a couple of cracking songs (the bold strings ‘n’ sax of ‘Garden Song’, and the superbly titled, fantasically morbid ‘The Sun Is Bored’). But then comes the second album, ‘Time Of The Last Persecution’. The stark black & white cover shows a changed man, some mad, bearded Rasputin figure staring disconsolately out of the frame. Fay looks utterly scarred, as though he’s seen something from which there’s no going back. You think ‘what on earth has happened to this guy? ?’, then you play the record to find out. It’s astonishing. 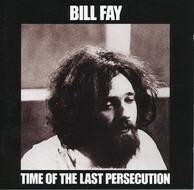 ‘Time Of The Last Persecution’ is a bonafide classic album, the kind you will keep going back to until the day you die. The fact that, beyond the occasional mention in Mojo (and that for his first album), Fay remains practically unknown is almost incomprehensible. This album makes a mockery of lesser figures who have persisted in the music crits’ lexicon, and while the likes of Dylan are certainly a touchstone for him, Fay really is in a class of his own here. The sound is stripped back from the first album to Fay’s voice and piano, and the intuitive playing of a backing band led by guitarist Ray Russell. Russell went on to be a major session player, but at the time of this album he was better known as a figure on the jazz improv scene. It gives his playing both a looseness and unpredictability that suits Fay’s songs perfectly, from shimmering harmonic runs to sudden outbursts of violent fret abuse. Fay’s songs are so thematically single-minded that they practically make this a concept album. Here’s a man who’s seen the light and heard the voice from the mountain, but has taken no solace from either. Here’s a man who knows that a reckoning is coming, and that a choice has to be made. The album is filled with end times imagery and apocalyptic language, but somehow Fay manages to keep it personal and intimate, caught between imparting dread knowledge while trying to spread some kind of reassurance. ‘Omega Day’ starts the album with a sunny country blues feel, but already Fay is being picked out for revelation by a stranger in a bar, informing him that the end of the world is nigh. The music is similarly upbeat for ‘Dust Filled Room’, but the lyrical matter is the examination of a broken life, years counted down with the smoking of cigarettes and the flicker of memories. ‘Til The Christ Come Back’ might seem to be explicitly religious, but the quiet cajoling of the verses acts as a subtle contrast to the witnessing, horns-fuelled chorus. Like many of the songs on this album, it sounds like some kind of modern spiritual, but without all of the fatuous proselytising that that implies. The Verve may have come up with the title ‘Urban Hymns’, but this is the album that truly deserves that name. ‘Release Is In The Eye’ makes the Winwood/Traffic connection clear, a flighty piano melody tethered by a majestic minor chord progression, with Fay declaring, “Christ is in the bathroom, look in any mirror on the wall - Satan’s in the garden shed, he’d like to screw you all” before the song abruptly fades under a torrent of guitar scree. ‘Laughing Man’ quickly follows, delicate piano notes and a lovely resigned vocal savagely undercut by a series of doomy bass chords and more scrabbling, desperate guitar. This is music in conflict with itself. The brevity of Fay’s songs are particularly striking. Only rarely do they make it over the three minute mark, and there’s strictly no middle eights. What you’re left with is a relentless, straight to the heart delivery, that makes its point then quickly leaves. The affect is strangely uplifting, suggesting that now is not the time to dwell on past failures, but to focus on what is to come. Both the lucidity and confusion they convey reminds me not only of Hammill, but also of other emotionally radicalised singers such as Roy Harper or even Ian Curtis. ‘Tell It Like It Is’ provides a brief respite from the storm, a lovely pastoral strum with a great acoustic solo from Russell, while ‘Plan D’ hints at the church hall blues of same period Stones. Then it’s the frighteningly prescient ‘Pictures Of Adolf Again’ - “In the papers, on the TV screens...” Beyond the obvious parallel with modern day cable channels’ obsession with Hitler as a ratings winner, Fay is talking about all despots and dictators, and the fact that the world seems unable or unwilling to rid itself of them. These are the real “Antichrist” that Fay says we must choose to turn away from. All of which leads up to ‘Time Of The Last Persecution’ itself, at nearly four minutes, the album’s epic track. It’s breath-takingly intense, the rolling, classical piano of the verse leading to a pummelling central riff that becomes more and more extreme and ragged with each return. And speaking as somebody who doesn’t particularly listen out for words anymore, lines such as the following literally demand your attention: “It’s the time of the last persecution, and Caesar shall be raised - He will ask for his feet to be kissed by your sister, and your children will fear at his name”. When Fay sings this in his strong yet resigned voice, the effect is absolutely chilling. Final track ‘Let All The Other Teddies Know’ sounds as though it might revert to psyche whimsey, but as Fay delivers the line “Be ready, Teddy, for when the cupboard explodes”, it’s clear that even childhood comforts won’t save us from what’s to come. Sure enough, the song is quickly obliterated by a reprise of the plunging bass and howling guitar from ‘Laughing Man’, the album ending with a long and final stare into the abyss. For all that, I wouldn’t want to give the impression that this is some kind of arduous, difficult to appreciate album - it’s not at all. In fact, in many ways, it’s a bracing, life-affirming album that shows somebody facing up to their worse fears and stoically overcoming them, accepting that we all have difficult choices to make. It’s also most definitely not some kind of Christian Rock record, despite the many references to Christ (though perhaps tellingly not to Jesus). So what happened to Bill Fay? After apparently no promotion whatsoever of his second album, Fay disappeared from the music scene, seemingly destined for a life in some austere millennial cult, waiting for the end of days to play out. The truth is slightly more mundane - Fay had just had enough, opting for a normal 9 to 5 existence, and only briefly coming to light again when See For Miles put out the twofer reissue I found in my library. Yet somehow, it seems right that Fay just stopped dead - you get the feeling that ‘Time Of The Last Persecution’ was his definitive statement, after which there really was nothing else to say. Try to hear this - it sounds as relevant today as it’s always been.